Available from our Print Gallery as a signed limited edition print. 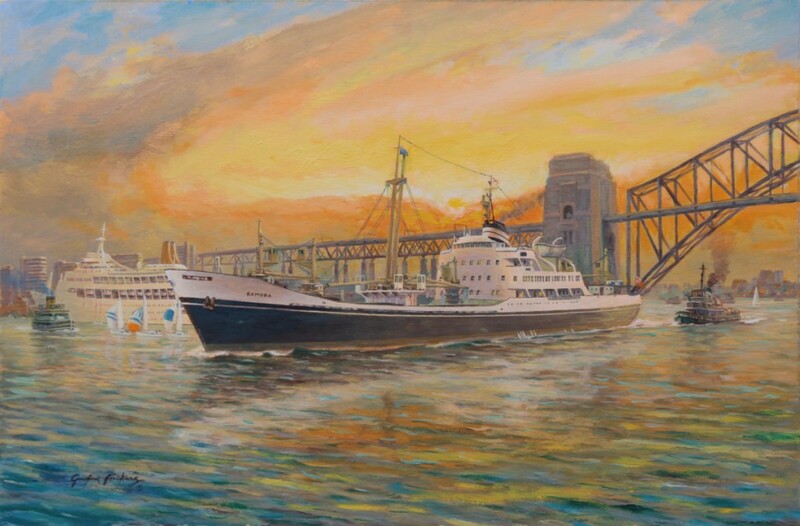 By Gordon Frickers of Plymouth, 50 x 81 cms (20″ x 32″), oils, original commissioned by J. L. of Keston, Kent. A carefully reconstructed scene from the last days of classic merchant ships, follow the ‘Further reading link below if you’d like to discover more. ” The beautiful print arrived safely on Friday. Many thanks. We’ll follow your instructions regarding framing etc” Best wishes, and many thanks, Peter and Jane 06.12.15. 2.54. The picture is available for £147.00 including packing and secure courier, enjoy. J.L. wrote; “Knowing the legendary Sir Robin Knox-Johnston commissioned a painting from you is more than a recommendation as far as I am concerned”. 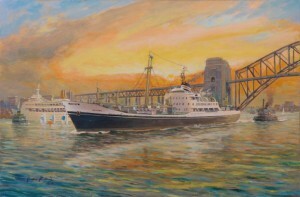 It was after seeing a collection of Gordon Frickers paintings of British India, Blue Funnel and Alfred Holt ships that Sir Robin asked to meet and decided to commission the artist. 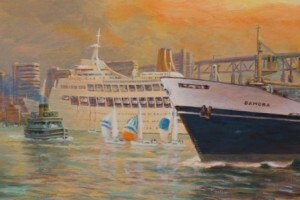 You too could own a painting of this quality from Gordon Frickers, contact us. Bamora (1961 to 1971) was a British India Steam Navigation Company ship. Although the company has a long fascinating history, was loved and respected, BI was little known in Britain, eventually merging (don’t say ‘taken over!’ to a B I person) with P & O who had built and owned Canberra. Happily P & O are still with us today. Gordon Frickers client comes from a family of sea men. He has worked in shipping all his life, still does. Mr. Leeson has a very personal connection with Bamora and Canberra about which he has written in ‘further reading‘. You can discover this and much more via the link below. To which I replied I did not paint it !! And I will quote you more when I can. Gordon Frickers artwork and texts: In some cases, educational and private use for example free use is permitted. By International law these pictures and texts may only be copied after written permission and a copyright fee has been paid.